Fall is my favorite season for food. Farms ignite with produce, and the market becomes one colorful treat. Pumpkin is the craze (naturally!) with squash not far behind. A few weeks ago two of my best friends from college flew to Boston from Chicago to visit me for a quintessential New England weekend. While we walked the Freedom Trail and went to a Red Sox game at Fenway, I knew that no New England fall was complete without going apple picking. There is something so satisfying about picking your own produce from the farm. Couple that satisfaction with hayrides and cider doughnuts and, oh man, you have the best day ever. I chose to take my friends to Russell Orchards in Ipswich, MA. About 50 minutes from the city, Ipswich is unique in the sense that there can be abundant farms just ten minutes away from the ocean. We were able to pick Cortland, Empire, Gala, Gingergold, Jonagold, Macoun, McIntosh, and just the last bit of Honeycrisp apples left on the trees. Apple picking is popular across the country, so plan to go in mid- to late September if you can. Some farms still have apples through October, so it may not be too late to either pick your own or catch your local farmer’s market for their bounty. After picking ten pounds of apples, it was time to bake! My Dad always made homemade apple sauce for us in the fall. It’s such a versatile dish, something you can have straight up for breakfast, warm up and ladle over vanilla ice cream, or have on the side with roasted pork tenderloin. The flavors are sweet, spicy, and altogether heartwarming! 2. Core the apples and cut them into wedges. You can peel the apples if you wish or leave the skin on. 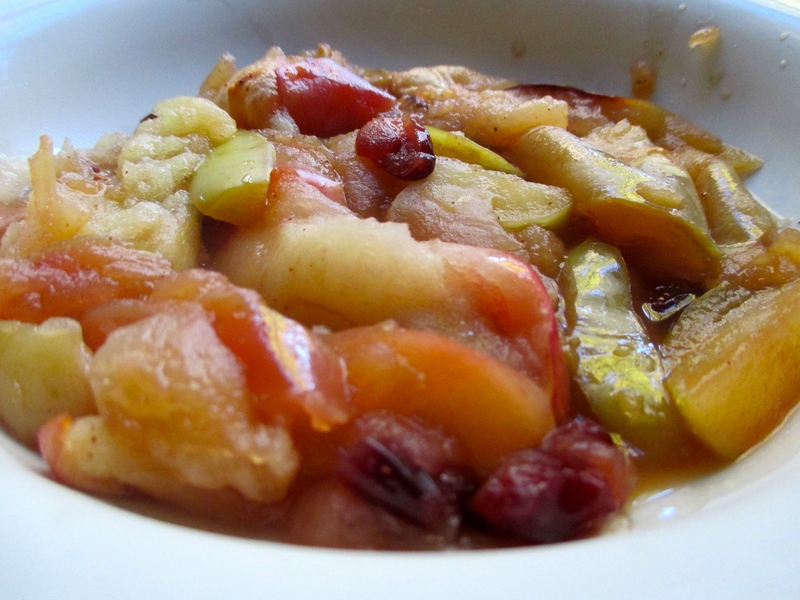 Spread the apples out onto your baking dish and add the craisens and/or dried fruit. 3. Warm up the apple cider, brown sugar, orange juice (and liquor if you choose) in a pot, stirring until the sugar is dissolved. 4. Add the lemon juice, nutmeg, and cinnamon to the pot and stir until mixed in thoroughly. 5. Pour the liquid over the apples in your baking dish. 6. Cook the apples for 45 minutes. Make sure the apples have some liquid on them so they don’t dry out too much. The potential for apple baking is endless. While apple pies, bars, and crisps are amazing, sometimes all you need is some simple applesauce to make your day better. Kristina DeMichele is a Senior Content Editor for Cook’s Illustrated magazine. A graduate of the University of Dayton, she moved to Boston and earned her Master’s in Publishing and Writing from Emerson College. Cooking fuels her soul with joy. She wishes to spread this joy to you.